The satisfaction is not the one I'm tempted by whenever I cycle over a busy motorway. After all, I'm sometimes down there on the road myself and besides, this is the movement of people and goods that keeps the wheels turning, so to speak. Most of the things society now relies on. So I'm just thankful not to be amongst it at this particular moment. It's my bike: a 2008 Ridgeback Panorama steel framed tourer. Ever since I bought it this bike has been a 'project' – work in progress with a niggling feeling there are things that must be improved, upgraded. In keeping with this philosophy I've fitted a Cateye TL-LD1100 LED rear light to replace the one I used the previous couple of winters. Someone on the CTC forums described this light as 'awesome' and it is. 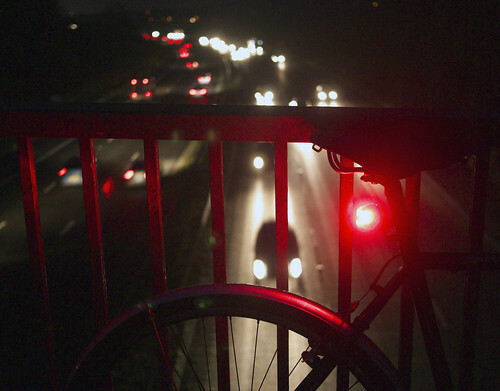 I fitted the light and set off to cycle my 20-mile loop just as it began to go dark – around 4.15 in the afternoon at this time of year. I cycle down through town and turn into an avenue towards the country. By four thirty I cannot see my bike. The front light illuminates the road ahead and behind me if I glance under the saddle is the red glow of the new Cateye blinking backwards. I don't even hear the bike. For some reason my mini pump handle has finally stopped rattling and there is only a light swish of tyres on the tarmac. I hear a bird squawking somewhere in the wind – a crow maybe (I know nothing about birds). The blackened outline of trees and hills moves against the deep grey of the night sky. Here, it is never actually dark. In the distance the towns of Blackburn and Preston glow on the underside of the cloud cover and I feel spots of rain on my face. A car blazes by occasionally, otherwise I'm on my own except for my bike. I cross over the motorway and stop to take the photo. The red light is flashing a message. My other bike is still work-in-progress: I'm fitting hydraulic disc brakes to replace the cable ones and over Christmas I'll build some better wheels. Then there's the crankset and pedals, and maybe the saddle and seat post to think about. But my Ridgeback is now hunky dory and I think it was this ride in the darkness that helped me realise how, with the Cateye light, no further upgrades are required. The bike is perfect for my needs and I must get used to not browsing Wiggle for what it requires next. Posted by Patrick on November 13th, 2011. I must get used to not browsing Wiggle for what it requires next. LOL Do let me know how to do this as I seem to have an unfortunate addiction! Its those spend so much get so much off offers that do for me, I always need to spend another £30 or so to qualify for the discount so in order to save £5 I spend £50 instead of the £20 I originally intended! I've been trying to talk myself out of buying one of those Cateye LD1100s for some time, they look great but do I really need another rear light? I've got 2 that are pretty good. Now you've really put the cat among the pigeons! You've reawoken my desire for this light and I've still got 3 hours to qualify for the Wiggle discount if I add the gloves that I don't really need as well! I can't advise you I'm afraid (I have a drawer full of cycling gloves), except to say the light is 'awesome' and winter is coming on... which reminds me I need some arm warmers. PS: I also receive those emails from Wiggle and I delete them immediately! That's all very fine Patrick, but before you know it Satan will have whispered some other requirement in your shell-like and you will fall like one of Seven Oaks' oaks in that hurricane, which was NOT a hurricane, except it didn't know that, some years ago now. The road to hell is paved with good intentions, 953 tubing, carbon fibre saddles, winter tyres, 461 pairs of gloves and so on. A parcel will be winging its way to me shortly. If I'd bought the same items in Evans it would have cost me an extra £21. How could I resist such a bargain?! I've got the same rear light on both my bikes and confirm they are indeed very good. Since I invested in my Thorn Audax (11 months ago) all I have bought for it is a tin of Proofhide and new mudguards. So suddenly I might be feeling a tad smug. Then I think of other cycling related things this year.... CTC membership renewed, padded mitts, a pair of cool sunglasses, an inner tube and a new helmet (somewhat begrudgingly). Now not so smug afterall. I really am happy with this bike. I'd been thinking of shallow drops, converting to 10-speed, Hope hubs, headset upgrade and one or two other things, but I decided to call a halt to all that. Garry might be right about another bike but I've no plans just now. I've no room for one anyway. Yes! LOL – If it was Wiggle it/they should arrive tomorrow. Amazing service. Chain Reaction is the same. But I must stick with what I've got, for the rest of the year, at least. The Hope Vision LED 1 is a Christmas present. My Cateye TL-LD610 LED rear light does me as a flashing unit and I have a Smart rear LED on constant. Even perfection has problems: when the rims wear out, we discover they are no longer available. When the blocks wear down, some super-dooper new materials are reputed to be far better, if twice the price. Arrived today, a bit slow for Wiggle , they must be busy! Light fitted immediately so I could try it out returning from a meeting at 3.30pm. It really is good, as I cycled past a white wall I could see the side lights flashing on it. Motorists all gave me a wide berth, it really does instil confidence knowing that your light is so visible. The gloves look very good too, or at least they will be when the weather turns colder. Opposable thumbs, Patrick. Humankind's inability to leave well enough alone is part of the evolutionary (bi-)cycle :). Very true Kern, which is probably why something's wrong!